It was mostly a growth and momentum market through the first three quarters of 2018, with momentum and analyst ratings being the strongest factors. Basically, what had been working continued to work. Fundamental and value were some of the factors that had the least influence. The story changed in the fourth quarter. 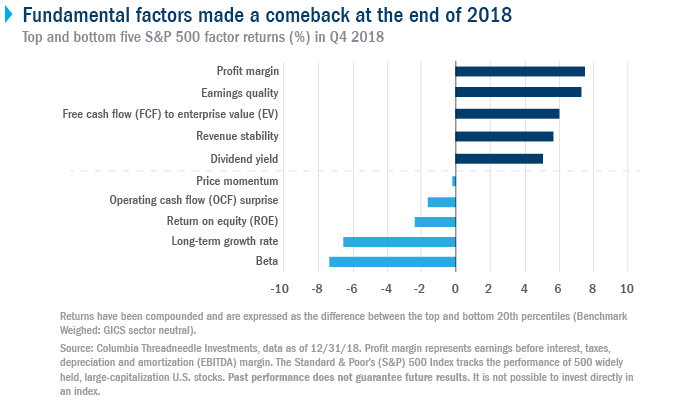 Fundamental factors that reflected underlying company characteristics such as profit margins, earnings quality, valuation ratios, revenue stability and dividend yield worked best in the fourth quarter of 2018.